If you look closely at the image, you will see two red balls, almost pointing to the corner pocket, but not close enough to make the plant. The two reds are actually touching, although this will work if they are not touching but very, very close together. Logic tells you that if you want to make that plant, you need to hit the first red on the right hand side, to push it to the left, and so hit the second red further on the left and so make the second red. If, instead, you hit the first red on the LEFT, slowly, as it moves to the right after being hit, friction between it and the second red will cause them to "stick" together momentarily, long enough to send the second red offline to the right, straight into the pocket. The slower you roll the cue ball, the more "squeeze"
The further to the LEFT you hit the first red ball, the more "squeeze". Watch the video, then try it yourself. What does it have to do with the Phantom Ball method of aiming? 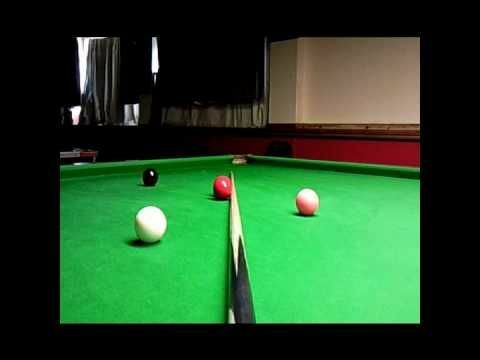 When a slow moving cue ball hits an object ball off centre, there is a small but ever so slightly visible "Squeeze" effect on the object ball; so the Phantom Ball aiming system is not exact, but is still a very good system to teach beginners how to aim. As you gain experience, I believe that you naturally compensate for this.